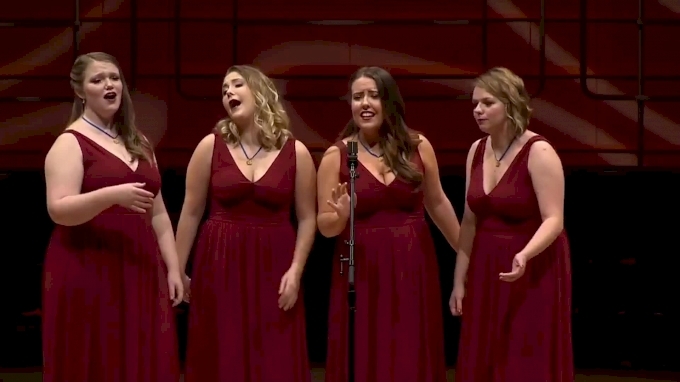 For many collegiate singers, singing on the stage at ICCA Finals is the ultimate goal. And once you make it, winning the Gooding Cup is the crowning glory. The groups who've won before, like five-time champions The SoCal Vocals, clearly don't show up with just a few rehearsals under their belt. The best sets don't come together in the weeks before the competition. Instead they are carefully planned - sometimes up to two years in advance. Aside from singing at a high level, the best groups also plan a theme or a story for their set, which includes song selection, choreography, and costuming. Song selection sets the tone for everything else. It's key for groups to select songs that fit their group in style and delivery, but also in talent level. It is especially important to pick songs that have perfectly suited soloists. In other words, they pick songs for the soloists rather than the other way around. How the songs fit together is also important. Each group has 12 minutes to wow the judges and the audience and the best received sets flow together nicely, even if they aren't all thematically linked. And finally, the look of the group is tailored to suit the set. Aside from looking cohesive, groups should also be able to move comfortably. For most that means leaving the short skirts, sky-high heels, too tight pants and other clothing that's hard to move in at home. However, whatever you can rock out in works - just make sure you're not tugging at your clothes, stumbling in your shoes, or otherwise distracting from the performance itself. The best directors will also have a clear plan of action in terms of how and when the group will progress through the rehearsals. Rehearsing enough so that the chords and rhythms are locked and the delivery is professional without being robotic is the goal. Unless a group happens to find themselves a director, arranger, and choreographer within the group that's mature beyond their years, most of the top groups hire or seek help. This help takes the form of arrangers, choreographers, and a wide variety of coaches to help with musicality and visual performance. Casual groups may meet once or twice a week with a few extra rehearsals leading up to the show. However, the top groups are meeting nearly if not daily, as well as during school breaks. Their rehearsal schedules look more like collegiate athletics rather than general music rehearsals. With a smaller group of singers and no instrumental accompaniment, these singers have nothing to hide behind. And in many collegiate arrangements, many voices are singing on their own part. This means everyone in the group has to do everything in their power to stay healthy. What does that mean? Getting enough sleep, drinking enough water, eating healthy, washing hands, and staying away from sick people on campus are just the start of it. Singers also need to be careful not to overuse their voices at sporting events and parties. Limiting alcohol and staying away from cigarettes is a must. Competing isn't cheap - and the total price tag to make it all the way to finals can often be a little more than most college students have at their disposal. The groups have to plan for entry fees and coaches/arrangers fees, but also travel costs to three rounds of competition. For a group of 18 singers flying from as far away as the UK, this means significant costs to fly in and stay in hotels. Many groups opt for some crowdfunding, but starting early with fundraisers alleviates stress and ensures that the group can focus on the music and not the money in the last few weeks. The final semifinal rounds wrap up on March 30 and wildcard entries will be judged in the few days following, with the competition culminating in NYC on Saturday, April 27th, streaming live right here on FloVoice.